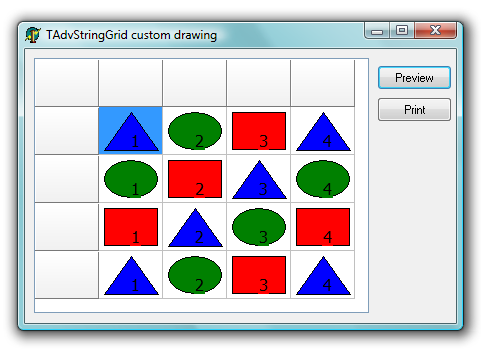 TAdvStringGrid has like TStringGrid always supported the OnDrawCell event to allow custom cell drawing. The OnDrawCell event is implemented in TStringGrid and the major drawback of this event is that it does provide the Canvas as a parameter. This makes it troublesome to use the event to allow custom drawing on the display canvas as well as on the printer canvas. Another problem with the OnDrawCell event is that there is no way to let the grid know about the size required to paint the custom cell. 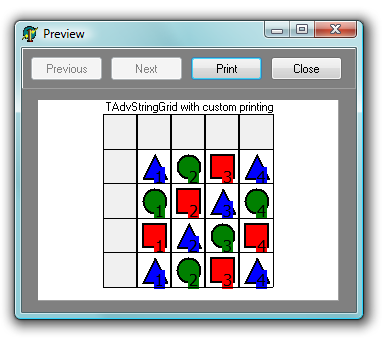 Therefore, TAdvStringGrid implements 2 new events that allow easy custom drawing on display as well as on printer through the events : OnCustomCellDraw and OnCustomCellSize. For cell display on screen, the Canvas property is equal to the grid control canvas, while during printing this canvas is equal to the printer canvas. The Printing boolean parameter indicates whether custom drawing is done during the grid on screen display or during a printout. With this extra parameter it could for example be possible to provide grey scale drawing during printing and full color for on screen display. With these 2 extra events, an entirely new range of capabilities for grid customization on screen as well as on printouts are opened.